Chia-Ling Chien, a condensed matter physicist at Johns Hopkins University, has received the prestigious 2015 IUPAP Magnetism Award and Néel Medal from the Commission on Magnetism within the International Union of Pure and Applied Physics (IUPAP). Chien, who serves as the Jacob L. Hain Professor and director of the Nanostructured Materials Lab in the university’s Department of Physics and Astronomy, was cited for pioneering discoveries in magnetic materials and nanostructures. The IUPAP Magnetism Award and Néel Medal are awarded every three years to a scientist who has made extraordinary contributions to the field of magnetism. The award is the highest honor bestowed by the IUPAP Commission on Magnetism. 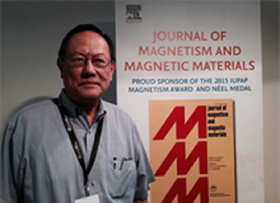 Professor Chien commented on the award: “Thank you, Elsevier, for sponsoring the IUPAP Magnetism Award and Neel Medal. Elsevier does a very good job publishing the journal of magnetism and magnetic materials, the key journal in the field!” Chien joins a distinguished group of prior recipients of the IUPAP Magnetism Award that includes spintronic materials pioneer Stuart Parkin, UC Berkeley Chancellor Emeritus Robert Birgeneau, and Nobel Laureates Albert Fert and Peter Grünberg. Together with the Editors of the journal, we congratulate Prof. Chien on this achievement!